A family-friendly street fest filled with art, music, crafts, and performance, the DWNTWNÂ Arts Fair is truly a cultural showcase that everyone will enjoy. Brought to you by a team of grassroots organizations with strong ties throughout our local community, our goal is to foster the growth of all the different artistic elements that make up our city’s culture. * An art exhibition of local artists curated by Life Is Art. * Live music and performances organized by Buskerfest. * Local urban artists and live painting showcase by YOMiami & Kondoit. * Photo-voice activities by Celebrate Diversity Miami. * Social-issues brainstorming meal with FoodSpark: Miami. * Pop-up Artisanal Tienda of arts & handcrafted works by Indiegals. * Pop-Up Poetry Station with Eat Your Poem. * A skyscape installation by Elwoods Gastro Pub. * Food and drink specials by local participating restaurants. Liza Santana-Pineres; Jessica Kizorek; Patricia Lamar; Paula Turk; Naomi Ross; Guy Hoyle; Joshua Kingston; JennyLee Molina; Rochelle Berman; Michael Valdes-Fauli; Angela Terrell; Anthony Jordon; Jonathan Rose; Richard Lehrman; James Goll; Stacy Horth-Neubert; George Milian; Brenda Leguisamo; Natascha Otero; Jennifer Rodriguez; Lauren Harper; Ezequiel Williams; Alessandro Abate; Alice Billman; Brittany Janes; Ted Van Cleve; Greg Romanelli; Jon Ridley; Mandy Baca; Mihai Crisan; Lynn Ponder; Kalunda Hilton; Jessica Wade Pfeffer; Patrick Barbanes; Gail Tapia-Ruano, Christine De La Huerta; Mandy Baca and many more! Life Is Art is presenting a number of excellent local artists showcasing a wide variety of visual art styles. A hub for local artists, Yo Miami has grown since 2011 into an ecosystem where creatives can get access to resources & contacts to help them reach the next level of success in their careers. By working with businesses, nonprofi t & community organizations we are able to foster a network which enables us to create opportunities throughout the year for artists to demonstrate their talents in ways that add value to our neighborhoods. With several monthly events at various venues around Wynwood, we continually o ffer a platform where emerging artists can reach a wider audience. At the same time, we show business owners the benefits associated with incorporating arts programming into their operations, & help foster the growth of our local communities through this synergy. 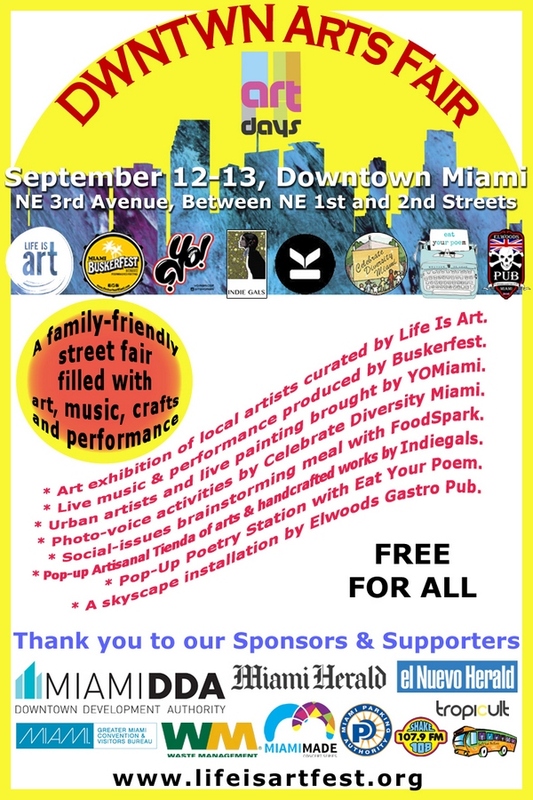 For Dwntwn Arts Fair we will be hand picking a lineup from Miami’s top artists. These artists will be live painting and displaying their work throughout the weekend. We encourage you to stop by our booth to meet these up and coming talented creatives to discover what inspires and motivates them, and watch them work live and in person. We strive for a connected, thriving urban core where the streets of Miami are active and enlivened with local performers, enjoyed by people of all ages and walks of life. We envision a joyous place that is reflective of the tropical urban landscape and attractive to locals and visitors alike.Â Enjoy performances programmed by Buskerfest Miami, featuring Buskerfest alumni such as Gypsy Cat Band, Pocket of Lollipops, Celestial and Liam Brien and many more. Celebrate Diversity Miamiâ€™s 2015 Photoâ€voice Exhibit focuses on celebrating the diversity of our greater Miami community with a unique array of large-scale photographs. It features 60 beautiful, vibrant images submitted by residents, schools, and organizations from across Miami-Dade County. Join us in celebrating our incredible culturally and ethnically diverse neighborhoods. Give a #DiversityMiami shout-out with a picture or postcard, and share what makes the place you call home awesome! By way of delicious food and great conversation, FoodSpark Miami will provide a fun, interactive gathering space for diverse groups of greater Miami residents to connect with one another, discuss key social issues with fellow citizens, and figure out how we can collaborate to improve the quality of life in our local neighborhoods. FoodSpark Miami is made possible in part by the 8-80 Cities Emerging City Champions 2015 Fellowship, which is funded by the John S. and James L. Knight Foundation. Every indie needs a hand, and weÂ¹ve partnered with artists from all over to bring a uniquely curated expo of artisanal goods, earthy designs, and conscious driven showcases. WeÂ¹ve connected with the indigenous tribe from Valle de Sibundoy in the Alto Putumayo region of Colombia, to bring the tribe’s delicately handcrafted jewelry, organic essential oils, and raw incense, led by the tribeÂ¹s artist Yolimar Loreto & the tribe-women. Also from Colombia, we present for the first time in the U.S Hagakure Home a small company based in Medellin whose home dÃ©cor is derived from organic materials, raw fabrics, and designed with earthy elements. WeÂ¹re bringing goods for the home and lifestyle. Then a young, hip, and hippie indie group of artists called Gypsy Halos will be dancing around our tent expressing their love and spirit through flower crowns, leafy jewelry designs, and airy fashions. This movement is not just focused on the younger generation. WeÂ¹ve connected with our baby boomer warrior woman whoÂ¹s love for mother Earth has helped her develop an artistic eye for floral designs; Esperanza (Hope) will bring to our expo her creative orchid, succulents, air flower gardens. Last but not least, our tent will feature an art showcase called Monsterz, an Anti-bullying picturesque story created by Miami’s local Tuli. We will feature other random goodies, our farmer friends may stop by with organic goods, or maybe weÂ¹ll have a pop-up artist color us alive! This is what Indie Gals does, we dig deep into the roots and help elevate indie creatives so that we can all break through the noise. Everyone deserves to feel the sunshine of success on their face. Your belly growls for a poem â€œto-go!â€ Words to feed the heart and soul! Eat Your Poem believes in the nourishing, potent power of words and this inspires us to the act of spontaneous, intuitive writing and sharing. Perched behind our vintage typewriters we create improvisational poems for you! Stop by our Pop-Up Poetry Station and take home a poem, created just for you. Yum! Poems are offered by donation and all proceeds go to Eat Your Poemâ€™s â€œPoetry with a Purposeâ€ Program. This community outreach branch of EYP brings poetic programming to women’s shelters, recovery centers and organizations that reach “at-risk” youth. Poetry with a Purpose is completing 14 sessions at Women in Distress in Broward County and we are slated to bring the program into Camillus House Shelter starting in mid-August. The local public house with gastronomical food served with great beer and wine.